French Boulle Table — Bernacki & Associates, Inc. 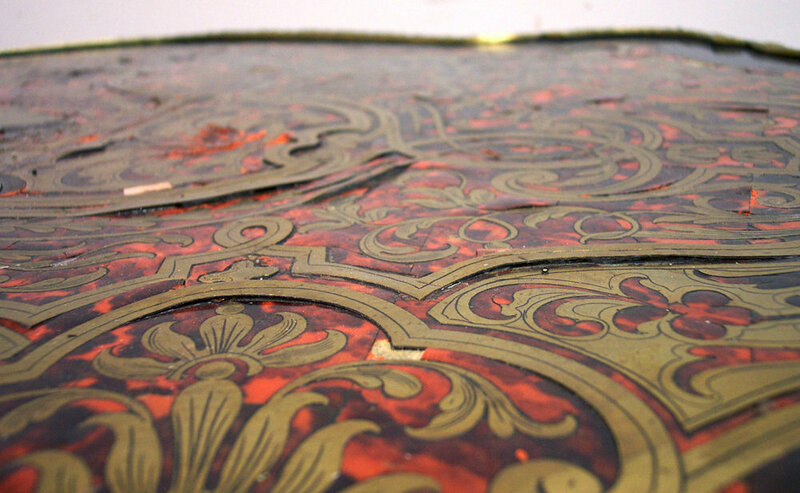 The piece shown below has tortoise shell ground with inlaid brass. Over time the adhesive that was used has become weak, and seasonal changes have caused the brass to lift and loosen in many places. Each piece of brass was cleaned of old adhesive, polished and reapplied. Missing pieces were replaced with new brass of matching gauge and tone. Once the structural damage had been restored, a shellac finish was applied to protect the piece and to enhance and deepen the color.